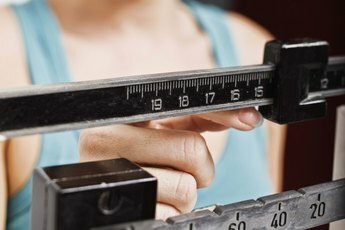 Your caloric intake plays a role in determining how much body fat you have. Counting calories can be tedious and confusing, but it is an important part of weight control. The amount of fat you have on your body is simple math. If you take in more calories than your body uses, you'll store them as fat. If you use more calories than you take in, you'll lose fat. Regular exercise helps you add muscle and burn calories, so consider your activity level when figuring out how many calories you need each day. Your ideal caloric intake depends on your age and activity level, according to the U.S. Center for Nutrition Policy and Promotion. If you exercise a couple times a week or spend a lot of time on your feet, you need about 2,000 calories a day to maintain your current weight. If you don't exercise and spend most of your time sitting, you need about 1,800 calories a day. If you are extremely active, you should get about 2,200 calories per day. Your age also plays into this. 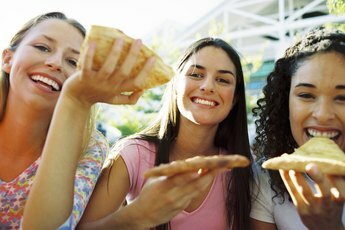 Younger women need more calories than older women. The kind of food you eat is just as important as the number of calories you get. The Institute of Medicine recommends that you get 45 to 65 percent of your total calories from carbohydrates and 10 to 35 percent from protein. The remainder -- no more than 35 percent of your calories -- should come from fat. Each gram of fat has 9 calories, while each gram of carbohydrate or protein has 4 calories, so avoid high-fat foods to stay within the IOM's recommendations. Getting regular exercise makes your body a more efficient machine. Aerobic activities, such as jogging, swimming, walking or playing tennis, strengthen your heart muscle, which speeds your body's ability to burn calories. Strength-training activities, such as weight lifting, add muscle mass to your body, which also increases its calorie-burning potential. If you are trying to lose weight, adding exercise to your routine while taking in the recommended number of calories per day may help. 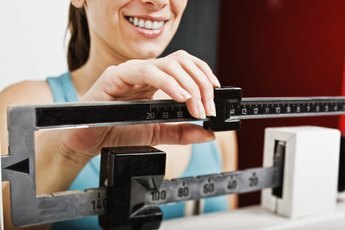 If you are active and want to lose weight by reducing the number of calories you take in, use a simple formula for gradual, long-term weight loss that won't be impossible to maintain. Each pound of body fat is the result of about 3,500 excess calories, according to MayoClinic.com. To lose 1 pound per week, reduce your caloric intake by 500 calories per day. In a week, this will add up to 3,500 calories you didn't consume. If you normally take in 2,000 calories a day, lower it to 1,500. Say no to that extra slice of pizza and use mustard instead of mayonnaise on your sandwiches. Switching from high-calorie drinks to water can also help you reduce the number of calories you consume.